The Christian or white wedding is usually only one of many celebrations. In this case, the bride and groom had already undergone two other wedding ceremonies. The “traditional” wedding entailed the groom’s uncle asking the bride’s family for her hand in marriage, and a subsequent (mostly symbolic) negotiation process between the two families. One week before the white wedding, there had also been a “court wedding” where the couple obtained their wedding certificate, followed by a smaller celebration. One of the most distinctive aspects of weddings in Nigeria is the colorful and coordinated clothing of the wedding party. As is the case in many Western weddings, the bride and groom coordinate the bridesmaids’ and groomsmen’s attire. But it is also common for the extended family, relatives, and friends to wear a certain color or even a certain fabric as specified by the couple. 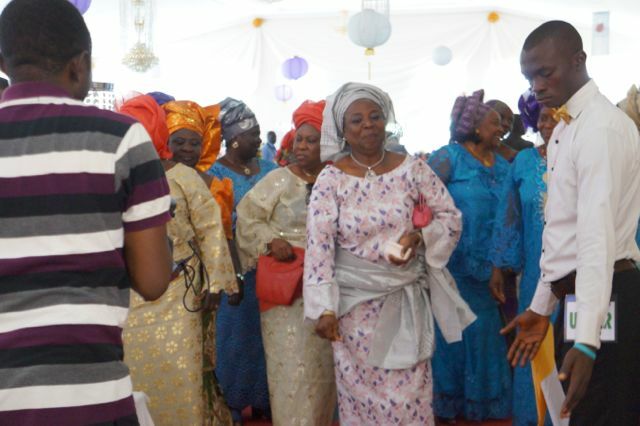 In this particular wedding, for example, relatives of the groom’s mother all had outfits made from the same purple fabric, while cousins wore red and blue. With a formal service, a banquet reception, and any number of informal after-parties, the wedding day is guaranteed to be long and full of excitement for everyone. The service at our friend’s wedding was uplifting and informal, and the Reverend and other ministers did a fantastic job of soothing the nerves of the bride and groom and encouraging participation from the congregation. Immediately following the church service, the happy couple departed from the church to a symphony of tribal music. Since they come from different tribes, the guests were treated to a display of traditional music and dancing from two different tribal groups. After the obligatory photographs, the formalities continued at the wedding reception. After all the guests had arrived, the wedding party danced their way to their tables at the front of the banquet all, and the MC moved through a packed agenda of introductions, speeches, prayers and dancing – all in the space of a few hours! Some events were familiar: the cutting of the cake, the bouquet toss, and the couple’s first dance are all a part of Western tradition too. But in Nigeria, the first dance takes on a life of its own, as the couple dances under a spray of cash. Although the MC asked guests not to spray the couple directly to avoid people trampling on the money, as the couple performed their dance, a note was delicately placed onto the bride’s forehead, and then the spraying commenced! Luckily, family members were on-hand to collect the money at the feet of the bride and hold it safe for the couple. It was a real privilege to have been a part of this special day. The warm welcome and kindness extended to the Tomato Jos team by the wedding party and the guests was fantastic. Should you ever have the opportunity to attend a Nigerian wedding we can only advise you to grasp the opportunity – and don’t forget to bring notes, along with your dancing shoes!